I fall ... 7 times and 7..."on the back and on the stomach"
I fall, at the feet, ... 7 times and 7 times, "on the back and on the stomach"—EA 316, by Pu-Ba'lu, and used in numerous letters to pharaoh. See: Commissioner: Tahmašši. 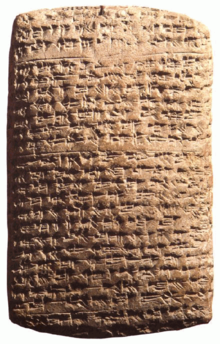 EA 161, letter by Aziru, leader ofAmurru (stating his case to pharaoh), one of the Amarna letters in cuneiform writing on a clay tablet. The Amarna letters (sometimes Amarna correspondence or Amarna tablets) archive, on clay tablets, mostly diplomatic correspondence between the Egyptianadministration and its representatives in Canaan and Amurru during the New Kingdom. The letters were found in Upper Egypt at Amarna, the modern name for the Egyptian capital of Akhetaten (el-Amarna), founded by pharaoh Akhenaten (1350s – 1330s BC) during the Eighteenth dynasty of Egypt. The Amarna letters are unusual in Egyptological research, because they are mostly written in Akkadian cuneiform, the writing system of ancient Mesopotamia, rather than that of ancient Egypt. The known tablets total 382: 24 tablets had been recovered since the Norwegian Assyriologist Jørgen Alexander Knudtzon's landmark edition of the Amarna correspondence, Die El-Amarna-Tafeln in two volumes (1907 and 1915). The correspondence spans a period of at most thirty years. The Amarna letters are of great significance for biblical studies as well as Semitic linguistics, since they shed light on the culture and language of the Canaanitepeoples in pre-biblical times. The letters, though written in Akkadian, are heavily colored by the mother tongue of their writers, who spoke an early form of Canaanite, the language family which would later evolve into its daughter languages Hebrew and Phoenician. These "Canaanisms" provide valuable insights into the proto-stage of those languages several centuries prior to their first actual manifestation. 3.3 "For the lack of a cultivator.."
3.4 "Hale like the Sun..."
3.5 "I looked this way, and I looked..."
3.6 "May the Lady of Gubla.."
3.9 I fall ... 7 times and 7..."on the back and on the stomach"
These letters, comprising cuneiform tablets written primarily in Akkadian – the regional language of diplomacy for this period – were first discovered around 1887 by local Egyptians who secretly dug most of them from the ruined city of Amarna, and sold them in the antiquities market. They had originally been stored in an ancient building that archaeologists have since called the Bureau of Correspondence of Pharaoh. Once the location where they were found was determined, the ruins were explored for more. The first archaeologist who successfully recovered more tablets was William Matthew Flinders Petrie, who in 1891 and 1892 uncovered 21 fragments. Émile Chassinat, then director of the French Institute for Oriental Archaeology in Cairo, acquired two more tablets in 1903. Since Knudtzon's edition, some 24 more tablets, or fragments, have been found, either in Egypt, or identified in the collections of various museums. The initial group of letters recovered by local Egyptians have been scattered among museums in Germany, England, Egypt, France, Russia, and the United States. Either 202 or 203 tablets are at the Vorderasiatisches Museum in Berlin; 99 are at the British Museum in London; 49 or 50 are at the Egyptian Museum in Cairo; 7 at the Louvre in Paris; 3 at the Pushkin Museum in Moscow; and 1 in the collection of the Oriental Institute in Chicago. The archive contains a wealth of information about cultures, kingdoms, events and individuals in a period from which few written sources survive. It includes correspondence from Akhenaten's reign, as well as his successor Amenhotep III's reign. The tablets consist of over 300 diplomatic letters; the remainder comprise miscellaneous literary and educational materials. These tablets shed much light on Egyptian relations with Babylonia, Assyria, Syria, Canaan, and Alashiya (Cyprus) as well as relations with the Mitanni, and the Hittites. 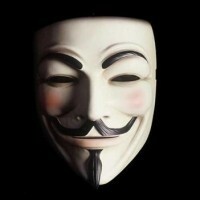 The letters have been important in establishing both the history and the chronology of the period. Letters from the Babylonian king, Kadashman-Enlil I, anchor the timeframe of Akhenaten's reign to the mid-14th century BC. They also contain the first mention of a Near Eastern group known as the Habiru, whose possible connection with the Hebrews — due to the similarity of the words and their geographic location — remains debated. Other rulers involved in the letters include Tushratta of Mittani, Lib'ayu of Shechem, Abdi-Heba of Jerusalem, and the quarrelsome king, Rib-Hadda, of Byblos, who, in over 58 letters, continuously pleads for Egyptian military help. Specifically, the letters include requests for military help in the north against Hittite invaders, and in the south to fight against the Habiru. Map of the ancient Near East during the Amarna period, showing the great powers of the period: Egypt (green), Hatti (yellow), the Kassite kingdom of Babylon(purple), Assyria (grey), and Mittani (red). Lighter areas show direct control, darker areas represent spheres of influence. The extent of the Achaean/Mycenaean civilization is shown in orange. 227–380 Canaan (written mostly in the Canaano-Akkadian language). Despite a long history of inquiry, the chronology of the Amarna letters, both relative and absolute, presents many problems, some of bewildering complexity, that still elude definitive solution. Consensus obtains only about what is obvious, certain established facts, and these provide only a broad framework within which many and often quite different reconstructions of the course of events reflected in the Amarna letters are possible and have been defended. ...The Amarna archive, it is now generally agreed, spans at most about thirty years, perhaps only fifteen or so. From the internal evidence, the earliest possible date for this correspondence is the final decade of the reign of Amenhotep III, who ruled from 1388 to 1351 BC (or 1391 to 1353 BC), possibly as early as this king's 30th regnal year; the latest date any of these letters were written is the desertion of the city of Amarna, commonly believed to have happened in the second year of the reign of Tutankhamun later in the same century in 1332 BC. Moran notes that some scholars believe one tablet, EA 16, may have been addressed to Tutankhamun's successor Ay. However, this speculation appears improbable because the Amarna archives were closed by Year 2 of Tutankhamun, when this king transferred Egypt's capital from Amarna to Thebes. A small number of the Amarna letters are in the class of poetry. An example is EA 153, (EA is for 'el Amarna'). EA 153, entitled: "Ships on hold", from Abi-Milku of Tyre is a short, 20-line letter. Lines 6-8, and 9-11 are parallel phrases, each ending with "...before the troops of the king, my lord. "-('before', then line 8, line 11). Both sentences are identical, and repetitive, with only the subject statement changing. A brick may move from under its partner, still I will not move from under the feet of the king, my lord.—Used in letters EA 266, 292, and 296. EA 292 by Adda-danu of Gazru. "For the lack of a cultivator.."
"I looked this way, and I looked..."
"I looked this way, and I looked that way, and there was no light. Then I looked towards the king, my lord, and there was light. "—EA 266 by Tagi (Ginti mayor); EA 296 by Yahtiru. "May the Lady of Gubla.."
a pot held in pledge—The Pot of a Debt. EA 292 by Adda-danu of Gazru. "...when an ant is pinched (struck), does it not fight back and bite the hand of the man that struck it? "—A phrase used by Labayu defending his actions of overtaking cities, EA 252. Title: "Sparing one's enemies". See the town of "Lakiša", Lachish, for "find" of one tablet, EA 333. Wikimedia Commons has media related to Amarna letters. Jump up^ Moran, William L. (1992). The Amarna Letters. Baltimore: Johns Hopkins University Press. p. xiv. ISBN 0-8018-4251-4. Jump up^ F.M.T. de Liagre Böhl, Die Sprache der Amarnabriefe, mit besonderer Berücksichtigung der Kanaanismen ('The language of the Amarna letters, with special attention to the Canaanisms'), Leipzig 1909. Jump up^ El-Amarna Tablets, article at West Semitic Research Project, website of University of Southern California accessed 2/8/15. Smith, Janet (2011). Dust or dew: Immortality in the Ancient Near East and in Psalm 49. Eugene, OR, USA: Wipf and Stock. p. 286. ISBN 978-1-60899-661-2. High-resolution images, from the Vorderasiatisches Museum Berlin. "The Tell el-Amarna Tablets". Catholic Encyclopedia. 1913. 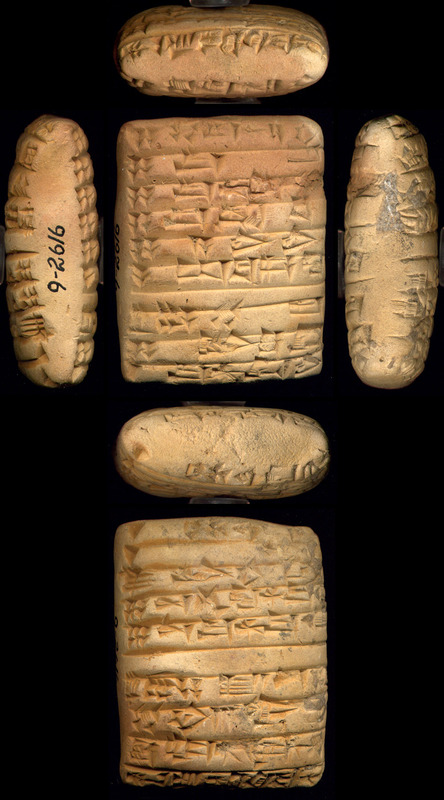 Electronic version of the Amarna tablets, Akkadian in English transliteration.